42-foot-tall statue originally discovered in 1928 has finally been unearthed – and archaeologists expect to find a second one nearby. Image released today by the Supreme Council of Antiquities showing the 42-foot statue unearthed by archaeologists recently. ARCHAEOLOGISTS HAVE UNEARTHED one of the largest statues found to date of a powerful ancient Egyptian pharaoh at his mortuary temple in the southern city of Luxor, the country’s antiquities authority announced today. The 42-foot-tall statue of Amenhotep III was one of a pair that flanked the northern entrance to the grand funerary temple on the west bank of the Nile that is currently the focus of a major excavation. The statue consists of seven large quartzite blocks and still lacks a head and was actually first discovered in the 1928 and then rehidden, according to the statement from the country’s antiquities authority. Archaeologists expect to find its twin in the next digging season. Excavation supervisor Abdel-Ghaffar Wagdi said two other statues were also unearthed, one of the god Thoth with a baboon’s head and a six-foot-tall one of the lion-headed goddess Sekhmet. Amenhotep III, who was the grandfather of the famed boy-pharaoh Tutankhamun, ruled in the 14th century BC at the height of Egypt’s New Kingdom and presided over a vast empire stretching from Nubia in the south to Syria in the north. The pharaoh’s temple was largely destroyed, possibly by floods, and little remains of its walls. It was also devastated by an earthquake in 27 BC. But archaeologists have been able to unearth a wealth of artifacts and statuary in the buried ruins, including two statues of Amenhotep made of black granite found at the site in March 2009. 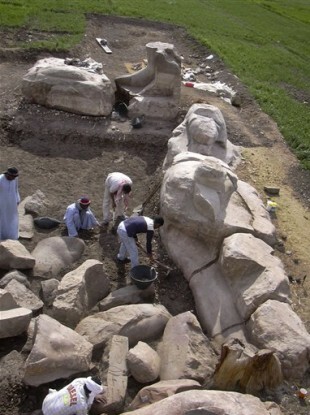 Email “Huge statue of Egyptian pharaoh unearthed in Luxor”. Feedback on “Huge statue of Egyptian pharaoh unearthed in Luxor”.